Seghesio Family Vineyard | Entire Productions, Inc. There is service and then there is service with style. Met by someone with good humor, forthrightness, a depth of knowledge and genuine desire to delight, I don’t forget. 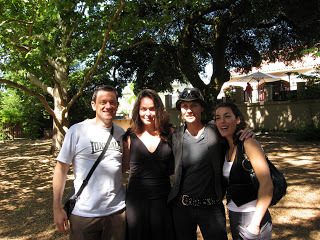 And so, our recent Sunday afternoon visit to Seghesio Family Vineyards in Healdsburg, Sonoma County, was unforgettable! The small private dining rooms hosting up to 16 people are full of Seghesio history memorabilia and artifacts that came alive via our passionate and knowledgeable hostess, Mary. Mary also shared impressive tidbits about the delicious food prepared by Chef Jon Helquist (formerly of Chez Panisse, Oliveto, the Martini House and Manzanita), and of course the illustrious life of the limited edition wines we tasted. Seghesio Family Vineyards is Bonded Winery number 850, making it among the oldest in the U.S. (There are now 6,000 wineries in California alone.) Bonded in 1902, the vineyards reap 80,000 cases of wine per year, a full 68,000 of them their Blue Label Sonoma County Zinfandel. Given the reach and popularity of these old vine wines, the remaining efforts go into producing 12 limited edition specialty varietals. If you go—and I highly suggest that you do go—ask for Mary or for Dana. Dana was my introduction to the Vineyards a few weeks prior and handles all events. Like Mary, Dana takes an admirable and infectious pride in her work with the Seghesio Family and thus makes you feel right at home. You may visit the Family Tables Friday through Sunday, 10 a.m. to 3:30 p.m. Call to reserve a seating at 707-433-7764. I’ve also included information below on a super fun event with a master of BBQ, Chris Lilly, brought in from the Midwest for the special occasion. There are two bocce ball courts on the property, and plenty of room for family lounging. Go. You will be happy you did! All-star BBQ Pit Master, Chris Lilly, will be back in town for our 6th Annual BEST of BBQ Festival! Our mentor Chris Lilly, who taught us how to make magic with our custom-built pits Blaze & Flame, will be here to test our skills and join us on the pit. Hot off the BBQ—enjoy our baby back ribs, pulled pork sliders and tequila grilled shrimp—which make for the ideal pairing with our Zins. Meet and visit with our family growers, who will be pouring our single vineyard Zinfandels. Sign up when you arrive for one of Chris' famous "Make your own BBQ rub" classes, with 3 sessions during the event. Enjoy live music by the Hellhounds, and nab a picture of your own "pit crew" at the Orange Photography's photo stand. Chris will be signing his Big Bob Gibson BBQ Book—(that's right, the secret recipes are out! ).